Everyone’s always looking for a droid, am I right? I know I want a droid. Get me one of those Roombas and I’ll be a happy camper. Seriously, someone send one over to me, my house is filthy. But, as to the matter at hand, this T-shirt is a fine example of how things could have been if The Force Awakens had come out earlier. MUCH earlier. Like, so early that it doesn’t really make a lot of sense. I’m sure BB-8 will make an appearance in a contemporary video game if he hasn’t already. I dunno, I don’t usually keep up with today’s games. But a pixelated BB-8? He wouldn’t even be able to move right. At least he wouldn’t slip around in the sand like Neil deGrasse Tyson seems to think he would. 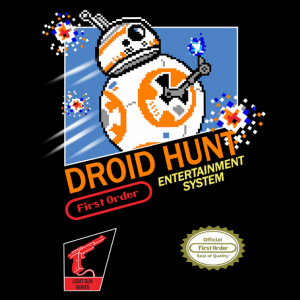 Now, if you’ll excuse me, I just set up my Android TV to play retro game ROMs, so I’ll be over here playing The Legend of Zelda: A Link to the Past while you look at your new T-shirt and fantasize about a BB-8 game.